Great article. Thanks for the more in depth explanation. I hope to do some of my research based on this idea. 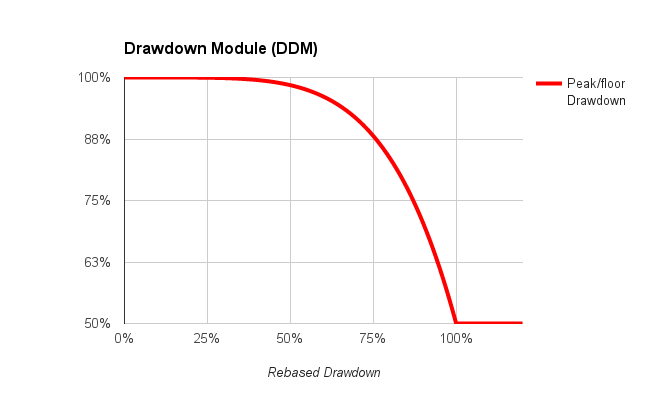 Trading Floor: During severe drawdown, how much capital should be allocated ? For example: when nothing seems to work, should You trade at 50% of your potential, 2/3 etc ? Great job here. I’ve only recently came across your website via Quora. Apart from the fact that your articles make a lot of sense, they are lighthearted and enjoyable to read. As you have stated above, extreme stress will visit each trader, it’s just a matter of how frequently it occurs. Bet size is obviously related to this as it leads to the quantity of and severity of the stress we feel during the course of our trading. It’s great to understand that given a bit of research there’s a lot we can do to mitigate this and other emotional risks to stay in the game long term. In my case, more recently, the development of my emotional understanding is helping me a great deal, both in and out of trading. For me, controlling my position size leads to better emotional experience post execution of trades. I do this via an anti-martingale strategy which reduces my bet size considerably after 2 consecutive losses, and each loss thereafter. but he also gives warnings about it as well, in that discretion can be used which, as we all know is asking for trouble in terms of interpretation. This can lead to over trading and illogical position sizing. Personally I don’t have issues with “discretion” or “over trading”whilst scaling in or out, it’s systematic. But I do take his advise on about the instructions provided on dollar bills, ie less and less position sizing, glad to see you do too. As a newbie in my early 20’s, I started trading with sweet F*** all (knowledge and money) but nonetheless I would still only bet what I could afford to loose. This was a blessing really, insofar as the size of my equity meant that my position sizing was pre-determined in a large part by those factors. The result of which was that I was able to stay in the game long enough to pick up and learn good habits. Those of us who are the best at managing loosing trades will achieve our goal of peak performance on the upside as well as the mitigate the downside. It’s all about staying in the game, understanding / accepting / leaning that about what is in our control and more importantly, what is NOT. Thank you for helping me with my trading development. Personally I don’t have issues with “discretion” or “over trading”whilst scaling in or out, it’s systematic. But I do take his advise on about the instructions provided on dollar bills, ie less and less position sizing, glad to see you do. Those of us who are the best at managing loosing trades will achieve our goal of peak performance on the upside as well as mitigate drawdown on the downside. It’s all about staying in the game, understanding / accepting / leaning that about what is in OUR control and this why your formula is relevant. Thank You very much for your comment. I really like the $ bill pyramid analogy. Thank You. Your 2 stop loss risk-off was inspirational. Great idea. I’ve been following your blog and posts on Quora and working on a small trading system. I was wondering if you could answer a question on position sizing. One of your articles suggests that the Convex position sizing approach would lead to higher returns (end equity) using the same strategy as compared to a fixed % risk model. I have been trying to research into using a fixed % risk model vs a “reverse martingale” convex model (decreasing one’s bet when one’s equity decreases) and I’m unable to obtain a higher equity curve at the same risk budget (e.g. 1%) . However, the convex model does have a lower drawdown. I’m intrigued by how “Secure f” convex model is able to outperform a fixed 4% equity model, but I’m not sure what is the max risk budget behind this line (is greater than 4% of equity? Or could it be due to the scaling in and out of positions (n1-n4)? Also, I was wondering if Volatility-based position sizing (Sizing positions based on an instrument’s volatility (not stops) and assigning a fixed % equity to determine lot size), and does it perform better in the long run compared to Percent risk based models? Thanks for your insights and informative articles! Thank You very much for your questions. It is a pleasure answering sophisticated people like yourself. fixed % risk model vs a “reverse martingale” convex model (decreasing one’s bet when one’s equity decreases) and I’m unable to obtain a higher equity curve at the same risk budget (e.g. 1%) . However, the convex model does have a lower drawdown. Equal weight 4% is already a big size position. 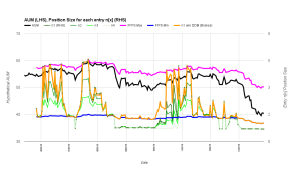 Many suggested sizes under our algo are near or smaller than 4% per our risk budget. The question then is more about buying power and volatility of performance for low correlated securities. 4% equal weight caps concentration at 50ish positions on 1 time leverage. Maybe it is enough, maybe not. It certainly has higher performance volatility profile. That is question You should ask your investors actually. Now, if You use a pairs strategy 4% on each side makes sense as performance is derived from the delta of both securities. Deltas are usually not that big, so bigger sizes magnifies returns. Pairs trading strategies have higher leverage 200% and above precisely to magnify otherwise underwhelming returns. My issue with pairs strategy is regime change. Pairs strategies give back a lot of performance when markets rotate. Example: later bear to early bull. Usually small caps and speculative stuff rallies hard while quality stuff underperforms. Mean reversion stops working during regime change. As long as You are aware of that and do not try to trade yourself out of a hole but reduce leverage instead, then transitions can be negotiated fairly well. Does it make sense ? You mentioned that scaling in and out (Reduce position by half) can help to improve distribution returns. 1)	If I assume that a trading strategy has a certain edge / profitable (under a fixed 1 lot backtest) , does scaling in and out improve that edge ? or does it reduce returns (and lower drawdowns)? If you go to the race horses and bet a single dollar on all horses, all you will have is average performance. Scaling in is adding 1 unit to a position. Scaling out is taking 1 or more. The problem with testing for signal is that it will not give you the depth of information you will need in real life. Sometimes, you want to invest but have no buying power. Sometimes you have too much cash. More importantly, all systems hit losing streaks at one point. Signal processing will not tell you how deep the hole will be. Example: on Forex, we continue to spend the vast majority of our time on money management. 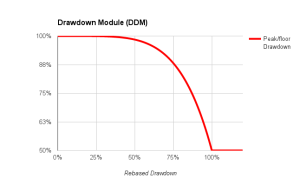 Our game is to reduce drawdowns, through mitigating the impact of false positives. This is a pure money management issue that cannot be solved through better entry or exit. We trade 26 pairs and some of them are notoriously difficult: EURTRY, AUDCAD, EURUSD (one of the worst actually). We mitigate their toxicity via intelligent penalty systems. 2) Reduce position by 50% (Is there a reason you picked 50%? Why not 70%?) Is this a value you optimised and backtested for a strategy or is there a mathematical reasoning behind this value? Yes I optimised it a long time ago, but I remain cautious about over-optimisation and backtest.